The one where I make a mozzarella stuffed meatball. 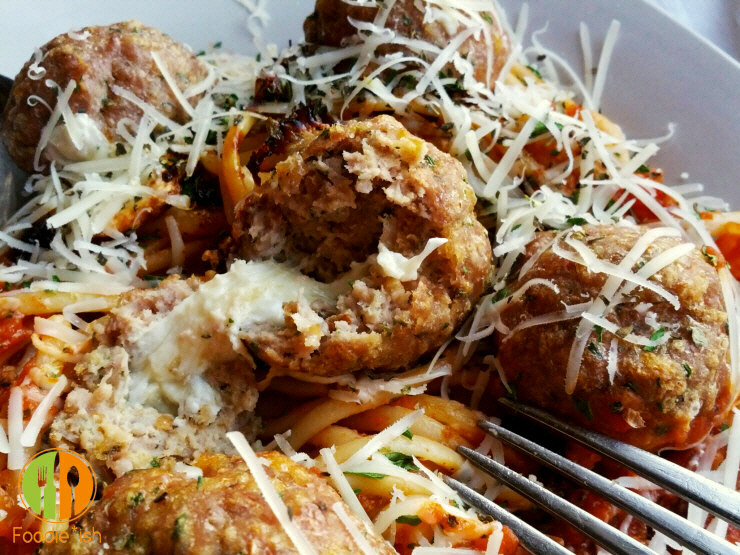 We’re talking meatballs… stuffed with cheese. There is nothing funny about that. We’re going through the last cold snap of Spring, and I am using this as an excuse to load up on all my cold-weather favorite foods before the months of perfect grilling weather and sunny day salads are upon us. 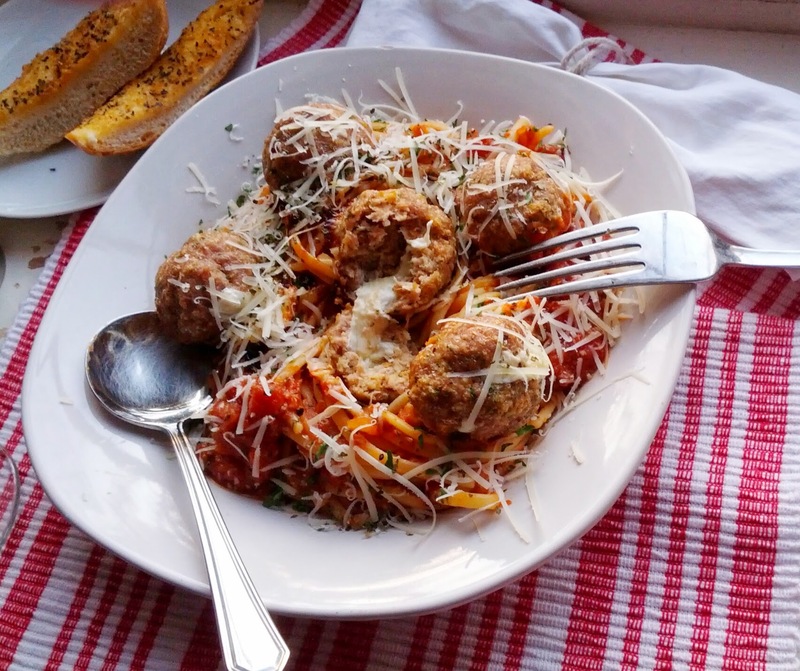 So, I thought I’d whip up a batch of some hearty mozzarella stuffed turkey meatballs served on a bed of the most perfect linguine covered in my Low and Slow Marinara. Seriously. It is ridiculously good. I love meatballs. Especially meatballs covered in cheese. 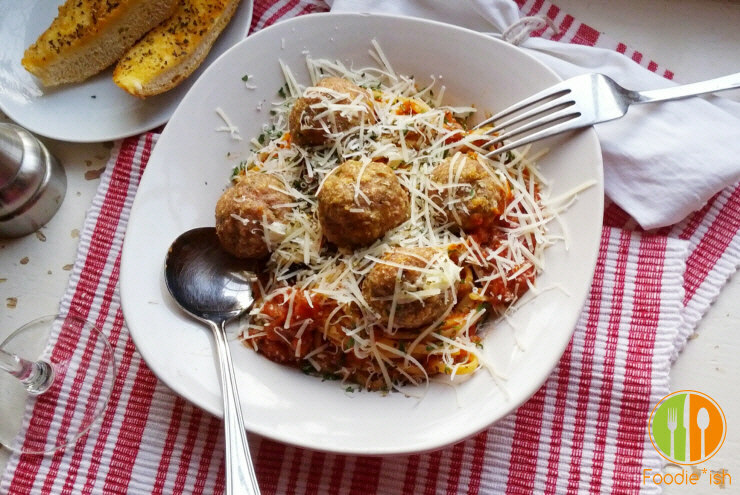 So what could be better than a meatball stuffed with cheese? Nothing, I tell you. And on a side note, I purchased imported Italian linguine (the DeCecco brand) for the first time when I made this and I must say, it was soooo good! The texture was perfect. It is a little thicker than it’s American counterparts which gives it the perfect bite. And it does seem to have a fuller flavor. It is a bit more expensive and I am usually a cheapskate, but since I don’t make pasta that often, I will be splurging on the good stuff from now on. At least, until I get a pasta machine and attempt to make my own (that should be hilarious, and I will definitely share the insanity). In any event, I highly recommend trying the imported stuff if you never have. Yum. Now go! 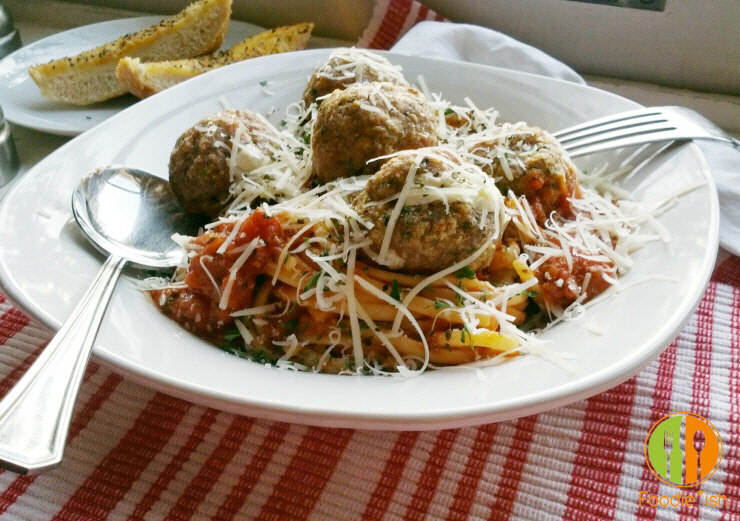 Go make yourself some meatballs before the weather gets hot and you put your hearty dish recipes away for the summer. In fact, just keep this one handy all year. Preheat oven to 350. Pour vegetable oil on a rimmed baking sheet. Combine ground turkey, beaten egg, panko breadcrumbs, garlic powder and parsley in a large bowl. Season with salt and pepper. Cut mozzarella into 25 small pieces (about 3/4 – 1″inch squares). Take a small scoop of the meat mixture (about 2 tablespoons) and flatten it slightly in the palm of your hand. Place a piece of mozzarella in the center and wrap meat around it, forming a ball. 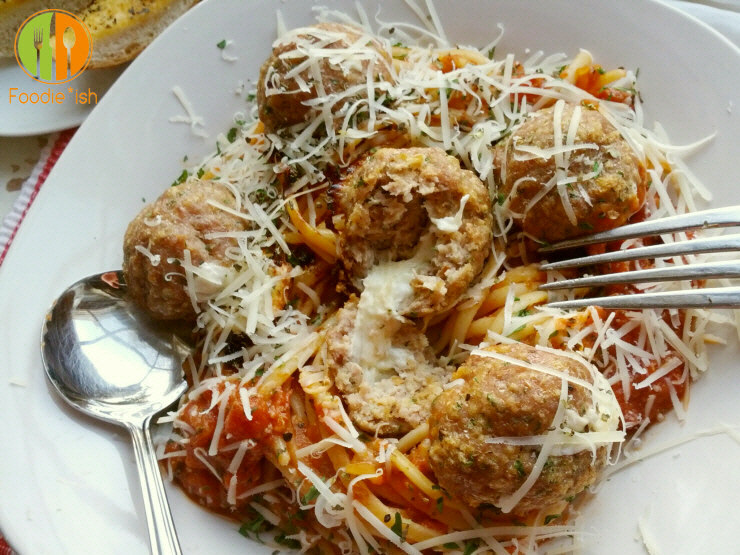 Take care to make sure the cheese is entirely sealed in your meatball. Roll on baking sheet to coat with oil. Repeat with all meat, making roughly 20-24 meatballs, lining each on the baking sheet after rolling in oil. Place in oven for 25 minutes or until browned and completely cooked, turning once half-way through cooking. 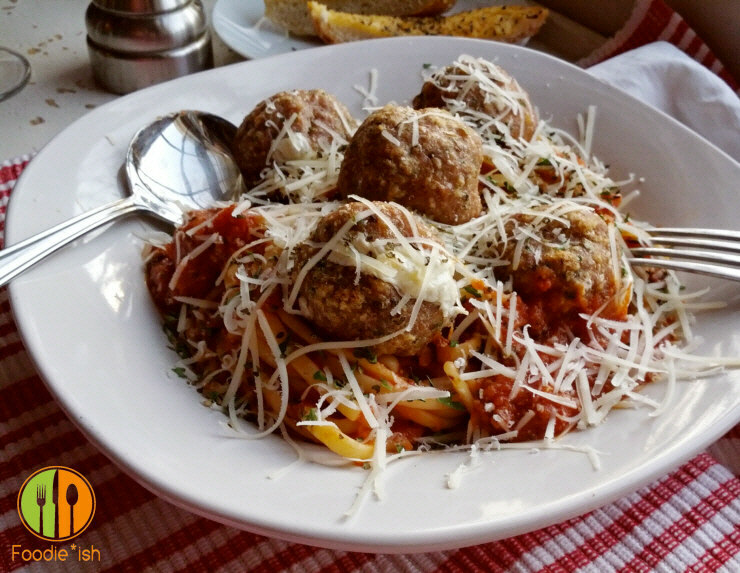 Serve immediately with linguine and low and slow marinara sauce. These can be prepared and frozen in advance for a quick weeknight meal. Just prepare as above, but do not coat in oil. Line meatballs on a baking sheet that will fit in the freezer and quick freeze them until set (about 2 hours). Then tightly wrap in a plastic bag and seal in a plastic container.